Arielle Prince-Ferron has marvelled at the beauty of nature since she was little. Before she could walk, she was camping and canoeing on the beautiful lakes of Quebec, Canada. 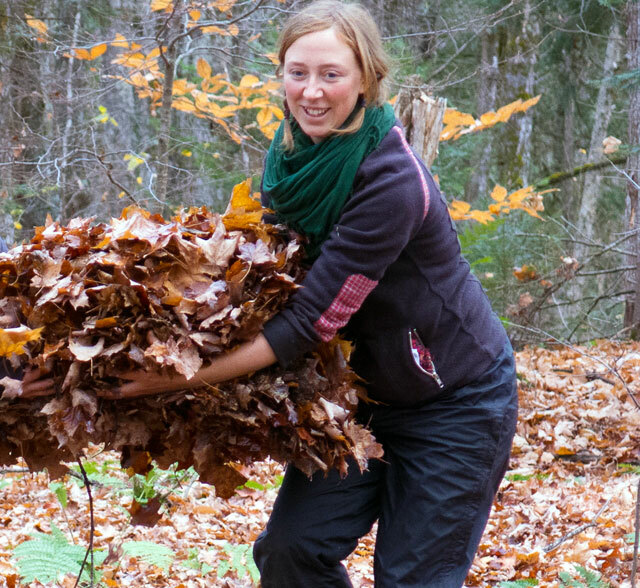 Since then, she has always nourished her relationship to nature by investing in related projects such as her university studies in Environment, the protection of René-Levasseur Island and the creation of the camp Des Forêts et des Gens. Arielle loves singing, dancing, gardening and making crafts from elements provided by nature. She has a love for cooking, a love that feeds our interdependence with all life – cooking in community with little people and big people and combining taste, beauty, freshness and purpose. She has often worked and organized collective kitchens for community and school projects. It is also fun for her to use storytelling as a gateway to a shared imaginary world where words, images and sounds lead us to discover, to ask questions and to explore other ways to be in relationship. Arielle has lived and studied Nonviolent Communication (NVC) for 4 years now. Along with other trainings, she completed the Animator Training program with Play in the Wild! in 2014. She is committed to living life authentically and sharing joyfully with young and old the richness of empathy and compassion and the importance of finding our place in the Circle of Life. Currently, she is involved in projects with Speak your Heart, Play in the Wild! and the Cooperative Des Forêts et des Gens.